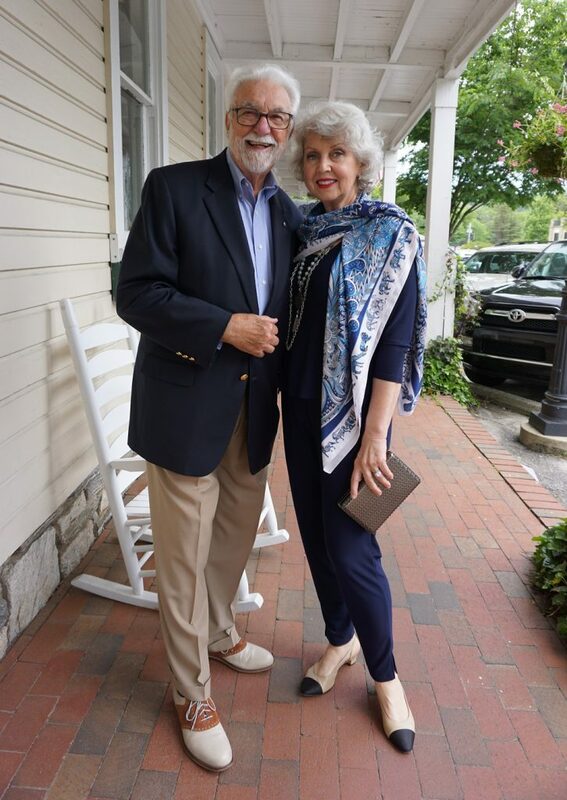 On the first evening of our getaway, we had a relaxing dinner at Wild Thyme Gourmet after enjoying the live dulcimer music performed in the courtyard. We took these photos at the lovely historic one hundred thirty-year-old Highlands Inn where we stayed. It is in the center of town, so it is very convenient for walking to many shops and restaurants. I wore the three-quarter sleeve navy top with the basic pants in navy from my site here. The night air is always chilly in the mountains so I draped this silk twill scarf over my shoulders and layered two French Kande necklaces. My affiliate links are here and here. The VANELi Aliz Slingback pumps are from Nordstrom. The metal clutch bag was from T.J.Maxx a few years ago. 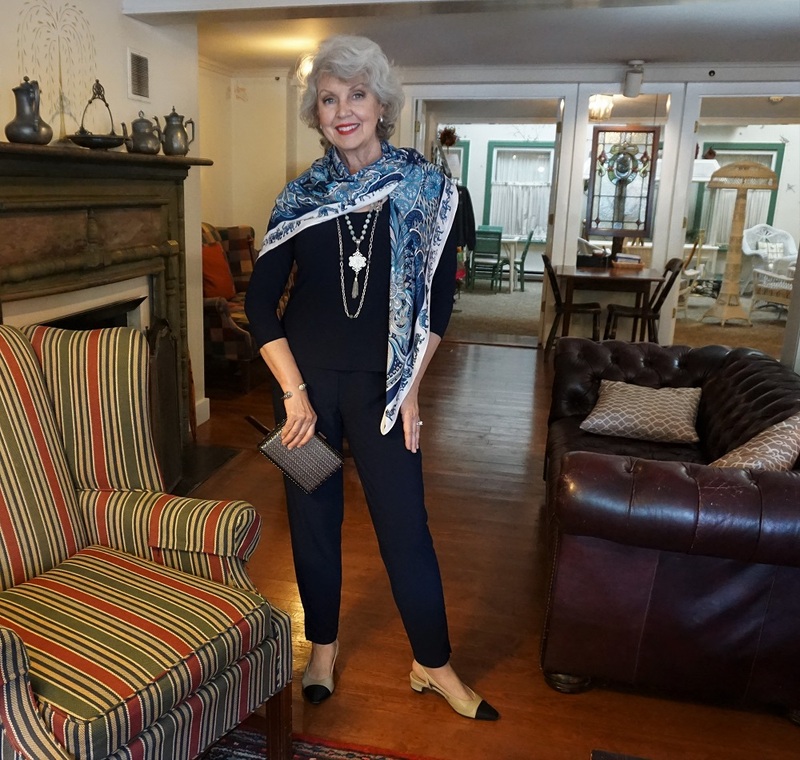 The large square scarf is folded into a triangle and draped to the side over my shoulders. The hair is a result of letting it air dry in the humidity. Mr. Mickey looks razor sharp from head to toe. Your scarf is a magic accessory. What a lovely way to tie your scarf Susan. Do you do anything to get it to stay that way. I find that the silk scarves sometimes move around and end up every which way??? I accept that fact that scarves are likely to move with my movements. I readjust them or change the way I have arranged them to suit what I am doing. You guys are so cute! Let the celebration continue! You both look fabulous and the outfit is inspired, scarf is beautiful. Dulcimer music is unusual and beautiful. So glad the instrument used to play Strayaway Child is still enchanting everyone. Have fun! Was it awkward eating a meal with the scarf draped in that way? If a scarf bothers me the way I have arranged it, I change it. I did let the ends fall to the sides in front while dining. You guys look so good….and happy! Stunning as usual!! I like how you layer the necklaces and the scarf. I would have thought it was too much if I attempted it. Looks fabulous on you. How do you make the scarf stay in place, or do you bother? I love your principles for choosing your wardrobe although your actual choices aren’t always what I would pick. 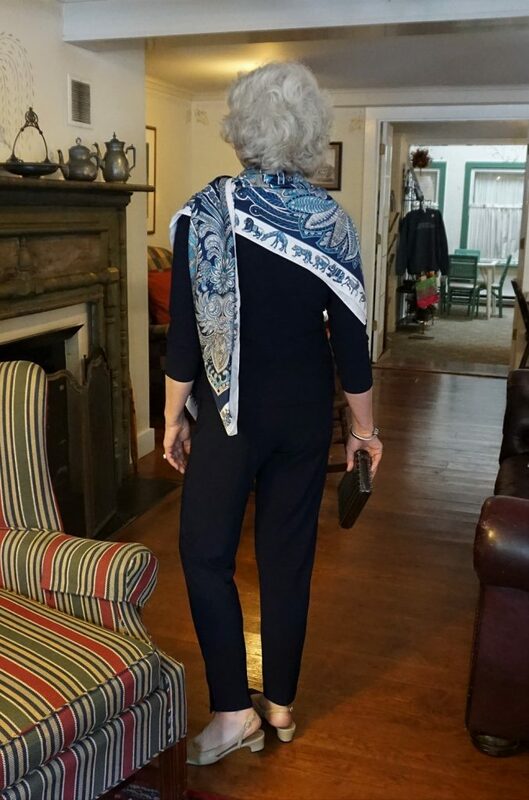 This simple navy top, pants and scarf is fabulous…on you, me or absolutely anyone! Love it!! You look beautiful as always. Always enjoy your posts and your fashion tips. Beautiful! Love the scarf and how you’ve styled it. I’m also a big fan of French Kande jewelry and have been searching in vain for a less pricey version of the look ever since first seeing it on your blog. Enjoy your celebration and blessings to you for many happy more! You are a beautiful couple. I think the coordinating outfits are a special touch. Love your hair this way! You guys are such a great looking couple! But I just have to gush over Mr. Mickey’s shoes — I absolutely love saddle shoes on men or women! Fabulous outfit on you! One of the best. Great pic of you two as well. You two look truly smashing! Lovely. I’m on track to reach my goal weight soon and an early investment will be your basic pieces. You and Mr. Mickey just look awesome! Happy Birthday, Mr. Mickey! You look so dapper and handsome. 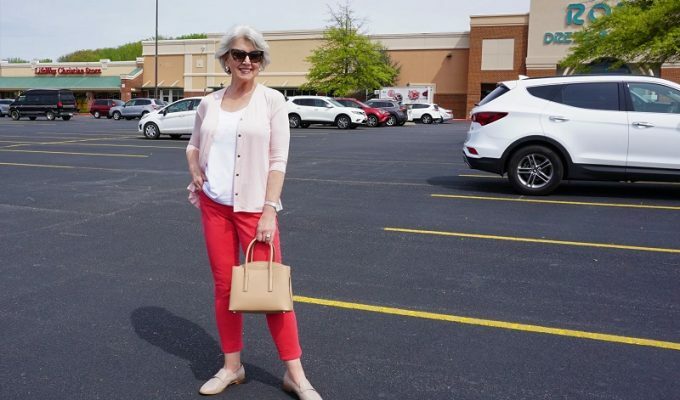 Susan, I have been following your blog for about five years and have learned so much from your fashion and lifestyle tips. I love the navy blue with the scarf as your accent piece. You look lovely as always. Have a wonderful week. Can’t wait to see your next outfit! Lovely as always! The scarf is striking, Susan. Totally makes the outfit. And, Mr. Mickey is dapper, as usual. Y’all are a very attractive couple, indeed. Absolutely perfect outfit. And Mr. Mickey looks handsome and elegantly casual as well. Susan, your style is the look I have been aspiring to but didn’t know quite how to go about it. Thank you so much for all your research and sharing. I feel so much better about how I dress now. Enjoy the rest of your get-away. Your closer to the body tops are so flattering on you! That is just lovely and the two of you are just adorable! You look great and gave me ideas for layering necklaces. My.Mikey looks dapper and fun! Keep these ideas coming. Tell Mr. Mickey he sure is stylin too!!! You both are looking great!!!!! Such a glamorous couple! Love both your and Mr. Mickey’s shoes. You guys are so cute together!! Have fun and enjoy. Love the curl from not blow drying your hair as well, just natural . Love the elegance of simplicity you portray. Thanks for always sharing your stunning looks. It’s nice to see Mr. Mickey, too. You are such a fabulous couple! You two are such a sharp looking couple. I enjoyed seeing Mr. Mickey smile. Effortless chic come to mind. You both look fabulous! Enjoy! I never would have thought to put those shoes with that outfit, but I really do like it! Looks great. And I like your hair too! Okay susan. I think you are doing a tremendous job at even t reading for us women over 60. But you live in the south. What do you wear when you are going to the beach. Bathing suits are a challenge for women Over 60. And what do you wear to go to the grocery store when the temperature is 90 and the humidity is unbearable? I share my life and how I dress for it. There are posts on the blog showing my bathing suit choice and what I wear to the grocery store. I am most comfortable with classic, simple items without a lot of detail, prints or colors. My chores and three-mile walks take place early in the morning, while it is still cool. Discovered your blog a couple of months ago when I made the decision to give up my shorter shorts for a longer version. At age 58, I have found great advice and examples in your posts and am embracing my classic style as I age. Planning my wardrobe now for my July trip to Highlands. Lovely as always! I love your style, but find it hard to copy. I am just over 6 ft and like a minimum 34 inch inseam onmy pants. Very hard to find pants that fit my legs, and my budget! Suggestions? He is so cute, If you ever place a date with him for purchase in your shop, I’m in! Looks lovely as always. I really look forward to your blogs. As a woman trying to keep to a capsule wardrobe since we moved to an apartment, I am an admirer of the way you put things together in such a clever way. Susan I still after all the years of following you, look forward everyday to your posts. I love this look in particular. It works for me so well also. I love the sparkle in your eyes when Mr. Mickey is behind the camera! Happy birthday month to him. I love that scarf and hope your shop will be restocked soon with that one. Thank you for continuing to share your fabulous classy look with us. I do have more of those scarves on order in three different color combos. They should be here in a few more days. Thank you! tres chic! I love the shoes you wore in this outfit of the day, classic and clean lines! Love this outfit. Enjoying your site as it brings a sunshine moment. Finally can see classy age appropriate fashions. Susan, you look absolutely beautiful! The outfit looks so stylish and would be easy for any woman to put together no matter their financial situation. I have criticized your new hair style in the past, but your hair looks lovely arranged in this style. You look fresh, younger and happy. It frames your sweet face to best advantage. I throughly enjoy your blog and look forward to each new blog! I live in AZ and this summer is hotter than ever. Unfortunately, I wilt pretty fast when going outside, but your ideas really help me to stay looking put together. Thank you for working so hard to offer your fun and constructive blog to we ladies of a certain age!